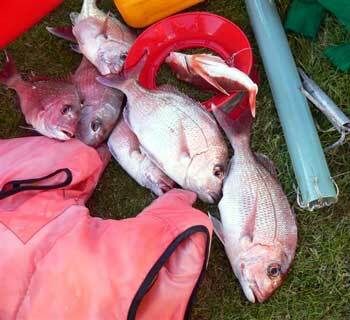 I spent Labour Weekend up at Te Arai point with Peter Veselotu fishing with Paul's Fishing Kites kayak longlines. 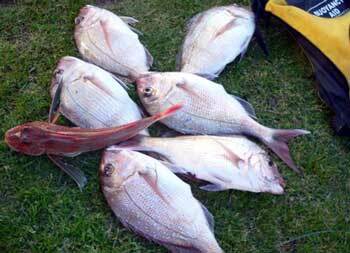 It was to become an awesome weekend of hauling in nice snapper and some huge gurnard. On Saturday we had a 1.5 meter swell that eased off to about a meter late afternoon. It was hot and sunny, we fished over an outgoing tide in 24 meters of water. 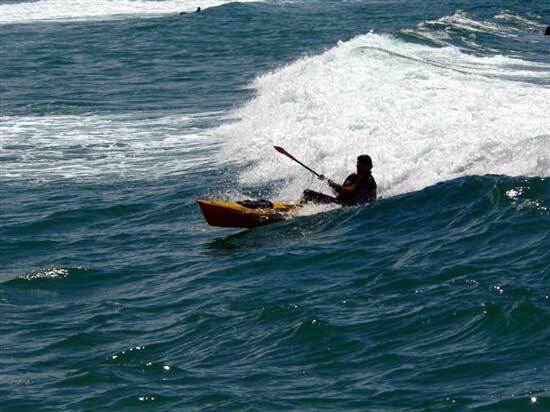 Kayak Fishing Photo Below : First you have to get out beyond the breakers! By Sunday the swell had dropped to below half a meter. Sunday was overcast with showers and moderate onshore sea breeze. We fished over the incoming to half outgoing tide in 15 to 18 meters of water. The time of the tide did'nt seem to make any difference to the fishing. We caught fish on every set. The total catch over three days for three kayak fishermen, all of who used Paul's Fishing Kites boat longline systems. 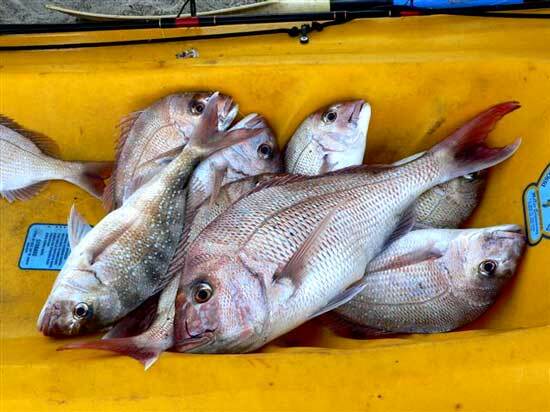 * 45 snapper ranging from pan size to 4.5 kilograms. * 16 gurnard some of which were rather big and fat. * Five kawhai, but all were small fish. Peter also used Target Snapper Hook Pilchard Rigs on his rod and ended up getting three huge takes that were lost due to snap offs on the light line he was using. One of the huge fish completely spooled his reel! We are looking forward for more kayak fishing this weekend to attempt again to land some of the bigger ones that got away. 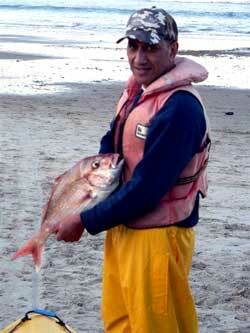 Fish Pic Left : Peter Vesetolu with one of the many snapper we caught over the long weekend. 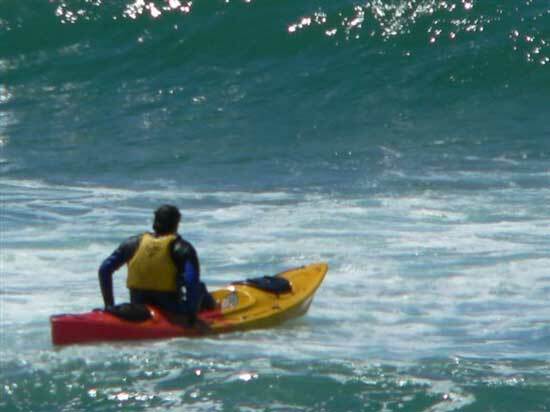 Kayak photo Below : And then you have to get back through the surf! Hi Rob Cullen here. I will be very sad if a handfull of folks succeed with their pressure for no vehicles on beaches. After a storm I was the only one at Uretiti Beach and rescued a large bird that was on deaths door step wallowing in the small waves. I put it in a nest I made out of dried debri and cut up all my remaining bait for it to eat. I would like to think that bird lived because of my actions. Had I not been there I am sure it would not have lasted long. On exiting the beach I was confronted by a greeny who tried to tell me that I had no right to be there, so I asked him to come see the bird. He just didn't want to know! Yes I'm all for you Paul and agree we must keep beach access for recreational fishers with 4X4 vehicles. In regards to taking 4WD's up the beach. I am 71 years old, I love fishing and have one of your fishing kite rigs I don't get out too much but I like it. I can't go out in a boat anymore and if 4WD vehicles were banned from the beach I would not be able to go fishing anymore - my legs just would not be able to take me along the beach! If you sit on the beach for a day you would see idiots drive up the beach the same as they do along the roads. When I travel along the beach I never go over go over 20 kilometers per hour. Yours in fishing, Harold Shaw.